Students of EEE are highly motivated to participate in cultural and extra curricular activities. Every year EEESUST organizes a cultural night with performance and engagement from most of the students of EEESUST. Other than cultural programs the department also participates in national events. To facilitate student engagement there is EEE society. EEE Society is for the welfare of students of department of Electrical & Electronic Engineering, SUST. The basic purpose of the society is to organize different programs on behalf of the department . 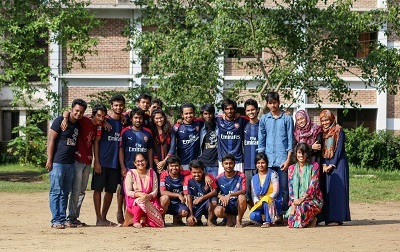 All the students of EEE SUST are general members of the society. All the teacher of EEE SUST are considered to be adviser of the society and one teacher is selected to be a treasurer of the society. The Society is responsible for organizing all the cultural, sports, project competition, seminar/workshop, picnic/study tour in the banner of the department and for publishing annual magazine. 5) "RF ID-Based University Automation System" under supervision of Tuhin Dev and Jibesh Kanti Saha. 6) "Multipurpose Automate Guided Vehicle (AGV)" under supervision of Jibesh Kanti Saha.